Phacelia is an annual flowering plant that produces masses of scented purple flowers. The flowers attract pollinators including bees to the garden as well as the nectar-feeding adults of insect predators such as hoverflies and lacewings. 10-13 weeks to flowering. 360 seeds per packet. Image by Mussklprozz (CC BY-SA 3.0). 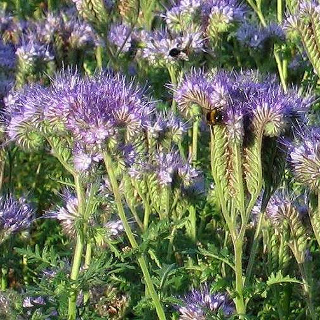 Phacelia is native to parts of South-West USA and North-West Mexico where it can be found growing in dry temperate regions. The purple flowers of Phacelia are attractive to beneficial insects especially hoverflies, the larvae of which are voracious predators of aphids. The flowers are nectar-rich and will also attract honey bees and other insect pollinator species to your garden. Phacelia flowers are sweetly scented. Phacelia grows up to 1m tall and is fast growing which makes it a great cover or green-manure crop. The root system of Phacelia although not particularly extensive has a beneficial effect on soil structure and is useful in breaking up clay soils. For optimum flowering choose a growing location for Phacelia that receives full sun or light shade, plants may become leggy or fail to grow if planted in full shade. Phacelia will grow and flower well in a wide range of soils providing they're sufficiently free-draining. Phacelia generally doesn't require any supplementary fertiliser, however if growth is slow or at the first sign of any nutrient deficiency apply a complete organic fertiliser as a top dressing around plants. Phacelia is tolerant of both mild frost and drought, although will grow best when watered regularly. While generally grown as an annual, Phacelia may be grown as a short-lived perennial in areas that are mild and don't suffer from extremes in temperature. In cold and mountainous regions of Australia sow Phacelia seeds from mid Spring to early Summer. In temperate areas of Australia sow Phacelia seeds any time during Spring. In subtropical areas of Australia you can sow Phacelia seeds from early Autumn to early Winter. Phacelia is unlikely to grow well in the tropics. Phacelia seeds should be sown about 5mm deep. For healthy, vigourous seedlings sow a few seeds into each planting hole and thin to the healthiest seedling. Space Phacelia plants about 15cm apart, this will allow enough room for their root systems to spread while still creating a solid carpet of flowers once the plants have established. Avoid surface scattering Phacelia seeds as the seeds require darkness to germinate. Phacelia seeds can have rather slow and erratic germination, but most seedlings should emerge within 14 to 27 days after sowing the seeds. Phacelia plants are fairly quick to flower with the first buds appearing 10 to 13 weeks after sowing. Phacelia has a long flowering period, the flowers buds unravel from long, curled spikes and continue to open one after another throughout the growing season.